Our thickest, toughest trimmer line available. 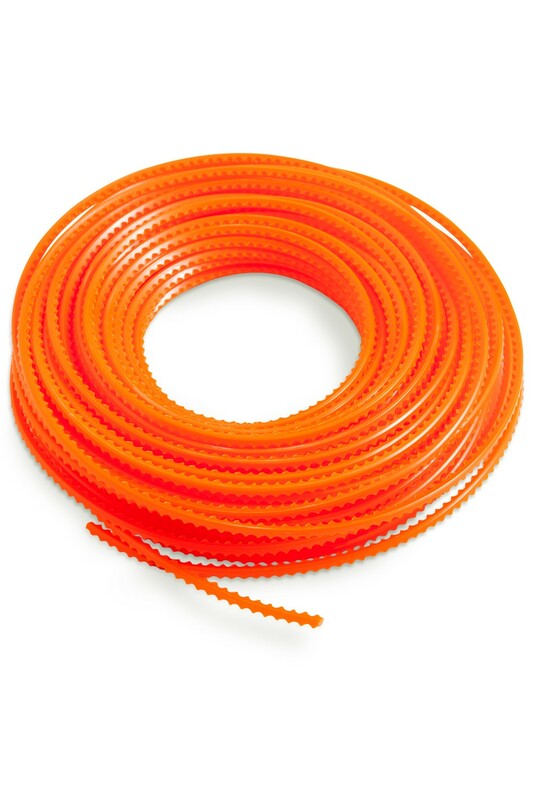 The Premium DR Sawtooth Trimmer cord is the thickest, toughest and longer lasting cord we have available. Designed to be used with the DR Quick-Lock Trimmer head, this DR trimmer line will slice through dense weeds, brambles and other thick overgrowth with ease. Click here to view the DR Quick-Lock trimmer head. The serrated design of the orange Sawtooth trimmer line enables it to slice through dence weeds, grass, brambles and other thick overgrowth effectivley. The 82ft roll of the orange 5.5mm DR SawtoothTrimmer line ensures you have plenty on hand for when the time comes to replenish the Quick Lock Trimmer Head. To be used in the Quick-Lock Head. The sawtooth trimmer line is only compatiable with the optional DR Quick-Lock Trimmer Head which makes replenishing trimmer line extremely easy. Simply cut four 13" lengths and insert them into the Quick-Lock Head and they will be tightly locked into position.